The new Tellurium IV is a real design Masterpiece which combines modern and classic in a particular futuristic form. A milled rosette rondeau that shows the 12 printed zodiac signs of the month and the date gives a fascinating view into the world of astronomy. 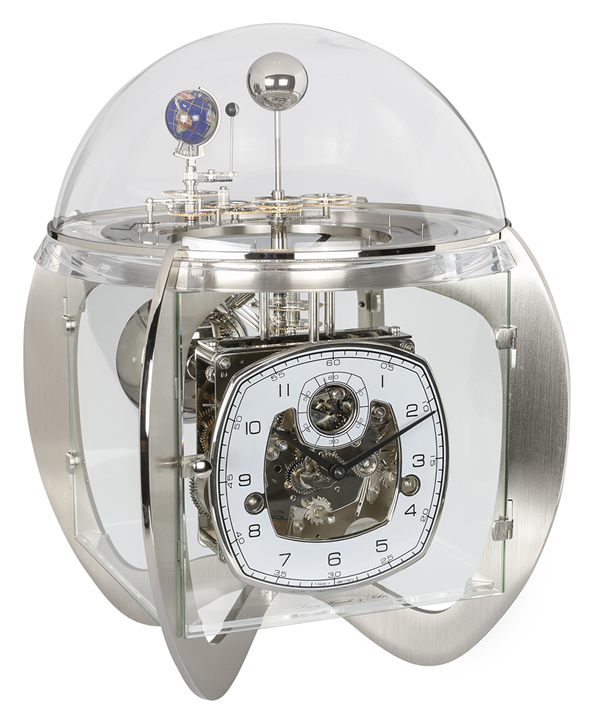 Especially distinguished is the spezial turned dial for this particular clock with a veiw through to the movement, which seems to float in a glass cube. The design piece reproduces the annual orbit of the earth around the sun, with the earth rotating around its own axis once in 24 hours. The moon, in turn, revolves around the earth in 29.5 days completing a full rotation around its axis. This allows the reproduction of the different moon phases as they are visible from earth. In the course of one year, the earth passes all 12 zodiac signs, months and individual days which are indicated on the flat disc. 8-day spring wound movement with 4/4 Westminster chime on 4 polished bells. Separate second feature, 11 jewel deadbeat Swiss escapement with automatic night shut-off. Click here to view the Hermle 23046-000352 Options and Prices page.